While its huge pixel count makes the A7R II a serious DSLR alternative for landscape and portrait pros, the impressive AF performance and video features give it much wider appeal. However, lens options are still rather limited. New: The Alpha A7R II has recently been replaced by the Alpha A7R III, which offers numerous performance improvements, while it should be able to deliver an even broader dynamic range. If the budget can stretch to it, then the newer model is the one to go for (or Nikon's D850), but you might be able to pick-up the A7R II at a great price. Then in September 2013 the company launched the RX1, an impressively small compact camera. A little over a year later the Alpha 7 and 7R were unveiled, and we really started paying attention. These were the world's first compact system cameras to feature a full-frame sensor, and their small size drew an audible gasp at the UK press announcement. While the Alpha 7 had 24 million pixels and was designed to be a 'fast' all-rounder, the Alpha 7R boasted 36 million pixels, and was intended to be attractive to landscape and still life photographers looking to capture masses of detail. Since then we've had the 12MP Alpha 7S, which is specifically designed for low-light and video shooting, plus an update to the Alpha 7, the Alpha 7 II, which has 24 million pixels. The A7R II is very much aimed at videographers as well as photographers, and it's the first compact system camera to offer in-camera 4K recording. 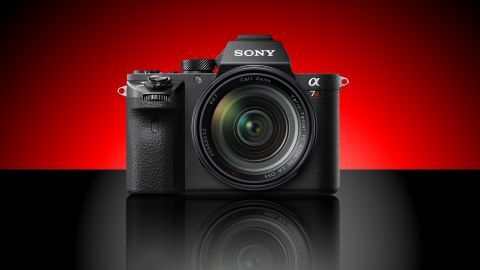 The latest addition to the range is the Alpha 7R II, the highest-resolution model yet, trumping the A7R's 36 million pixels with an effective pixel count of 42.4 million. This is coupled with Sony's Bionz X processor, which enables a native sensitivity range of ISO 100-25,600, with expansion settings taking the range to ISO 50-102,400. It's also possible to shoot at up to 5fps (frames per second) with functioning continuous autofocus (AF). To push detail resolution even further, the sensor has no optical low pass filter (OLPF). And to enable the photosites (pixels) to be made bigger than they would otherwise be, the A7R II is the first camera to feature a full-frame back side illuminated (BSI) sensor. Sony has also used copper wiring instead of aluminium on the sensor, and this helps to increase the sensor's readout speed by 3.5x over the original A7R's. In addition to boosting image transfer times this should help improve autofocus speed, and help combat rolling shutter effect in video mode, as the information is relayed quicker. With no anti-aliasing filter, larger photosites and a copper wiring design, the A7R II's full-frame Exmoor R CMOS sensor has been designed to deliver both high resolution and faster performance. Whereas the original Alpha 7R has a contrast-detection autofocus (AF) system with 25 points, the A7R II has a hybrid AF system that combines both contrast and phase-detection focusing. This has a total of 399 points covering 45% of the imaging area. Sony claims the A7R II's new sensor design enables the autofocusing system to be 40% faster than the previous camera's, while new algorithms enable better motion tracking. With this in mind the new camera has a wider range of focusing modes than the original model. These include Flexible Spot and Lock-on AF (Wide/Zone/Centre/Flexible Spot – with small, middle and large options as well as Expand Flexible Spot) to follow moving subjects. The camera uses data about object distance from all of the AF points to ascertain the location of the subject, whether it's moving in relation to the background, and the location of other objects in the scene. In another first for a full-frame camera, the A7R II has in-body 5-axis image stabilisation, which helps reduce image blur in stills and jitters in video footage. Sony has upgraded the 0.5-inch 2,359,296-dot electronic viewfinder to an OLED, and there's also a new shutter unit that's designed to create less vibration and which has a 500,000-cycle life. Although Sony says the A7S is the best option for shooting video with a full-frame compact system camera, the A7R II is the first full-frame CSC to offer 4K recording in-camera; the A7S requires an external recorder. There are two options for recording 4K footage with the A7R II; the best quality is produced when the camera is set to Super 35mm, as there's no line skipping or pixel binning. The downside to using this mode is that the video frame is narrower than when shooting stills. Alternatively, Super 35mm mode can be turned off so that the camera uses the whole imaging area – presumably with pixel binning. Other video-related improvements over the A7R include the ability to use Picture Profiles and set specific values for Black Level, Gamma and Knee (highlight compression), plus colour adjustment (Colour Mode, Colour Level, Colour Phase and Colour Depth) and Detail. The Gamma settings include Sony's S-Log2 setting, which is claimed to increase dynamic range to up to 1300% to retain highlight and shadow detail, and generate footage that looks very flat straight from the camera but which is ideal for post-capture grading. Movies can be shot in XAVC S format with MPEG-4 AVC/H.264 compression, or AVCHD with MPEG-4 AVC/H.264 or MP4: MPEG-4 AVC/H.264 compression. In NTSC the maximum quality option is XAVC S format at 4K and 30p/100Mbps while in PAL it's XAVC S 4K at 25p/100Mbps. As usual Full HD shooting is possible, with frame rates up to 60p at 50Mbps (NTSC) or 50p at 50Mbps (PAL). There's also Time code to help with scene identification and syncing footage from multiple cameras.